Atlantis se trouve à seulement six blocs au sud de la zone de promenade dans le centre de Carolina Beach. Vous êtes à pied des commerces, des restaurants et des activités estivales telles que feux d'artifice, manèges et musique live. Suivre les pêcheurs arrivent avec la pêche du jour à la marina ou dîner avec la famille. Vos prochaines vacances dans la belle plage de Caroline vous attendent! The location is amazing, right across the street from beach access. The interior had a musty smell but got better as we've been there for a few days. It's not in amazing shape but the price was good and we had a nice time. If I was going to be there more than a few days, I would recommend a unit that's a bit more updated and in better shape. Hi Wallene- thank you for your comments. This is an older home, but it is in a great location and is priced accordingly. We are glad you had a great stay, and we hope to see you back at the beach again soon! Overall the property is in good condition (there is a leak above the tub). It was exceptionally clean. The master bath could use a little updating; specifically the shower. 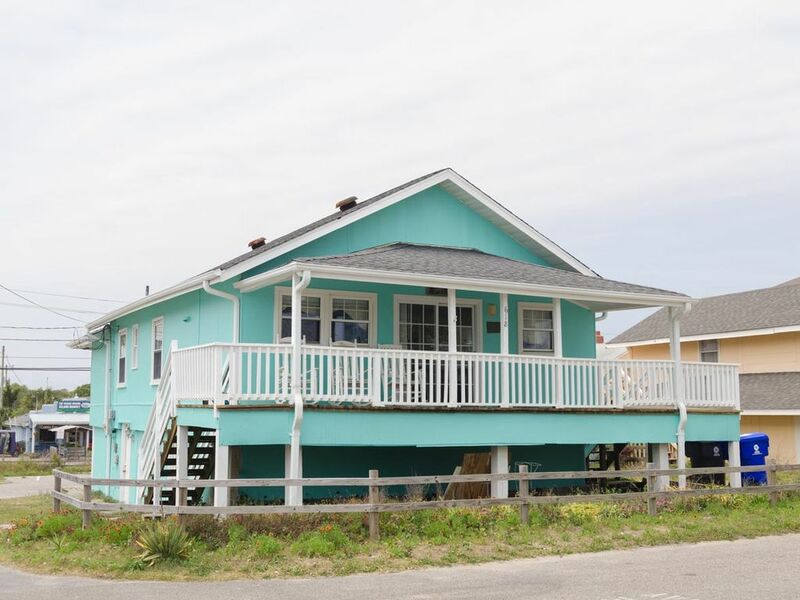 The location is perfect - just a few steps from the beach access; a nice "grocery store" right across the street; within walking distance to many attractions and restaurants. It could use a couple more rockers on the front porch. The two that are there are great. We could have used an additional parking space. We had to park one of the cars in the Food Lion parking lot a couple of miles away. That was a little inconvenient. Especially since there are additional spaces available at the house. I would stay there again. The property had not been cleaned when we arrived at 3:30PM, but we were told that is had been cleaned. We had already taken in our bags and had to wait for someone to come back and clean. The house is in a great spot but it is falling apart and desperately needs to be updated. The hot water in the MBR shower did not get warm, none of the BR sinks drained, kitchen drawers were broken, back door blinds were broken and did not close which allowed no privacy at night. We appreciate your response. We apologize that the house was not cleaned to your standards and we did deploy a team immediately to you to fix the issues as we would have been glad to do for the other issues that you described if we had known about them. We hope that you had a nice vacation. Hi Mary- thank you for your comments! We hope you had a wonderful stay and that we will see you back at the beach again soon! What a fantastic stay! 6 Girlfriends from College and I truly enjoyed this spot. a Stones throw away from public beach access, right across the street from the Veggie Wagon (great with 3 Vegans in our crew), and a front porch perfect for hanging out and people watching!.....We will be back!